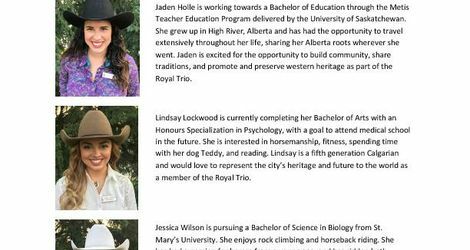 Calgary – On Monday, September 25, 2017, six talented and accomplished young women will compete for the final time in hopes of being named the 2018 Calgary Stampede Queen and Princesses. The crowning will take place that evening, immediately following the final portion of the intense, month-long contest. Competition has been fierce and extremely close, with the top six selected after showcasing great horsemanship skills, public speaking abilities and poise under pressure. They will again demonstrate their talents and abilities beginning at 7:30 p.m. in the Agrium Western Event Centre, before one queen and two princesses are chosen and crowned. Crowning ceremony - 9:00 p.m.